1969 was the year we walked on the moon. 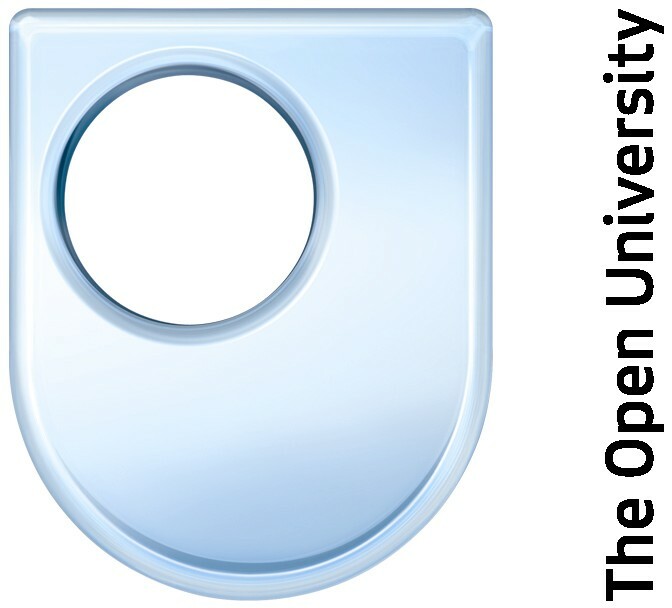 It was also the year the OU was formed, now an important beacon in the academic landscape. With over 200,000 students (none on campus), it’s easily the largest University in the UK. I personally regard it as the single greatest education institution in the UK, and it’s formation in 1969 (first students 1971) as the most important 20th century achievement in UK education. Remember that’s it has a much longer pedigree than any of the 64 post-1992 Universities. It consistently rates high on student satisfaction studies and teaching excellence, and attracts tens of thousands of foreign students every year. Remember also the way it reaches out to those with disabilities, in prison, full time employment and in the armed forces. What’s shameful is that other universities haven’t taken the model more seriously in terms of technology, content, support and tutoring. 1 in 4 students at the OU are aged 17 to 25, as ambitious young people want a degree without being burdened with massive debts and the much exaggerated ‘social experience’. It also reflects the increasing thirst for higher education from older, part-time students. Fees are around half that of a campus-based university and a great deal of effort is made to support those who could struggle to pay. In addition, you don’t have the ‘luxury costs’ of the drunken meander through a three year degree with accommodation, living expenses and beer money. The module, credit system is also admirable, allowing students to progress with a set of wider set of intellectual interests at a pace that suits them. The range of qualifications and sense of clear progression is another virtue. Of course, it’s not without its problems. I, personally, think that it could do without being a ‘research’ university, and its cost base in terms of curriculum development was badly managed and expensive. It also burned £20 million is a spectacularly unsuccessful foray into the US. This was all down to poor leadership and management. I believe however, that these problems have been addressed. 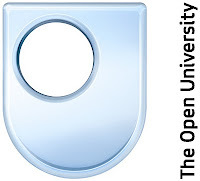 I had dinner with David Willetts recently, along with the excellent Martin Bean, Vice Chancellor of the Open University, and several other Vice Chancellors. The OU model got a good hearing and we see signs that this government is sympathetic to the OU model being adopted, in part, by other universities. This more flexible approach to university education would save costs, provide higher quality teaching, get away from building yet more buildings and stop the whole system being fixated with the ’18 year old undergraduate intake’ model. It would drag many of our universities into the 21st century and allow us to cope with higher student numbers at a lower cost, all without sacrificing student satisfaction and teaching excellence. That would be a move towards maintaining our system as ‘world-class’. England appear to be the new Scotland as British international football descends to a new low. But it’s not only football, in the Olympics we only seem to excel in sports where we have to sit down on expensive equipment like rowing boats, sailing boats, bicycles and horses. There is a clear class divide here as almost all of these medals come from people who attended public schools and have the money to purchase stuff the developing world can't afford. The rugger/footy divide is also, in effect, a class divide, one that’s at its worst in tennis, where bowing to the queen is a bigger news story at Wimbledon than the failure of a single English tennis player to qualify for the tournament. But in all the talk about foreign managers and goal-line technology and Premier league tiredness, and poor LTA leaders, one major causal factor is missing – the abject failure of our schools to encourage competitive sports. My wife comes from a very sporting family, her father was a heavyweight boxing champion, one of her ancestors won the British Open at golf, her sister’s daughter broke the Scottish record for the backstroke twice this weekend, my nephew has been signed for a Scottish Premier team at age 10 and my own sons have competed at international level in Tae Kwon Do. What is strikingly obvious is the failure of the state school system to play any part in any of this success. They succeed in spite of their schools, who are largely indifferent to their success. I attended a meeting at our school where parents railed against the failure of the school to have a basketball team, tennis team and so on. The school has two tennis courts that haven’t been played on for years and are without nets. What a waste of public land. School sports days were shambolic ‘who cares who wins’ affairs. When my son won a medal at the World Championships it didn’t even merit a mention in the school newsletter. All of the success I mentioned above came from being part of clubs,with talented coaches, outside of school. That’s where the success is nurtured. OK, it’s easy to be a critic, so what’s the solution? As schools and ‘PE’ seem to turn more people off than on to sport, I’d scrap the whole system of PE teachers, and periods for PE in schools, and use the money to give vouchers to kids to spend on coaches and clubs outside of the school system. The extra time spent teaching other subjects should result in an increase in standards. More importantly, a wider range of sports would be available to young people with thriving clubs run by dedicated and professional coaches. At the start of every year as many external providers as you can muster should be invited into the school to demonstrate their sport and sign people up – a bit like clubs at Universities. The existing sports facilities should also be made available year round to external coaches and clubs who want to use the facilities. I’d also focus on habitual exercise, like football during breaks and lunchtime, and campaigns to get kids to cycle and walk to school, rather than by car and bus. Well, my last blog post on the CIPD fat cat salary scandal caused quite a stir, with the CIPD quickly deleting the erroneous claim that their CEO was a Director of Shelter from their website. Garry Platt then kicked off a good debate on TrainingZone and a blistering thread opened up on the CIPD members group on LinkedIn. It was clear that the vast majority of commentators think her salary is obscene and that the CIPD has lost touch with its membership and the real world. I’ve even had several promises of resignations. 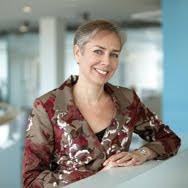 Then something odd happened; the current President of the CIPD, Vicky Wright, weighed in with a defence of her salary that was weak as a kitten. Just to be clear, Jackie Orme earned £405,000 in 2009, the year before Geoff Armstrong earned £428,000 in 2008. There is a small difference in the basis salary (10k), but Geoff received nearly £100,000 in pension contributions that year (presumably a sort of pay-off). What is morally reprehensible is the President, Vicky Wright (who chairs the Remuneration committee) using one fat cat salary as a major defence for another. Let’s be clear about the Geoff Armstrong/Jackie Orme comparison. I blogged about this over two years ago, in March 2008, pointing out the obscene salary paid to Geoff Armstrong. In 2006 he was taking out a cool £500,000, a truly astronomical and ill-deserved sum. The fact that he was more rapacious doesn’t make her obscene remuneration any better. This defence claims that you would expect to pay a large salary for the HR Director of a large multinational company, but Jackie Orme was never anywhere near this level. In any case, since when were Charity CEO salaries and bonuses benchmarked against HR Directors in huge private sector organisations? In fact, Jackie Orme has never been the HR Director of a large international private sector organisation. She was NOT the HR Director for Pepsico, merely a national HR Director and I’d bet a lot of money on her salary having been a good deal lower than 405k. If it was at this level, let her reveal it. Remember that she was described by a real Head of HR as “an unknown player…..you’ve got to questions her credentials”. No mention from El Presidente on the drop in revenues, rise in costs, redundancies and bonus freeze for others in the organisation. And no mention of the fact that she lied about being a Director of Shelter for over a year on the CIPD website (it was removed only after I pointed it out on my blog post). She hasn’t written, hasn’t phoned…. (I still have the screen shot, as I suspected they’d pull it quickly). I believe that Gill Rider is to be the next El Presidente. Interesting choice as she is the Head of HR across Whitehall. To put it another way, Head of Civil Service Capability Group (widely seen as inefficient and incapable) and Head of Profession for Civil Service HR, widely criticised as being responsible for the excessive salaries and bonuses for top Civil Servants. You may not know much about Gill Rider, but she was subject to a severe mauling from the press after the government awarded a £400 million contract to De La Rue Printers for passports. Turns out she’s a Director of de La Rue,and although resigned briefly, returned as a Director the very day the contract was awarded. She was also accused of nepotism by appointing colleagues of hers to top Government posts. The whole murky story is here. The CIPD is turning into a second-rate dictatorship lurching from one incompetent leader to another. The refusal of the current President to address the real issues and concerns of the members in the debate is symptomatic of the problem. The self-serving leadership of the organisations is way out of touch with its membership and clearly out of touch with the current political and economic context. People are right to protest at this egomaniac behaviour, where people get rewarded for failure. The CIPD should be taking a leadership role here, not being seen as greedy and out of touch. They have lost all right to moral authority on the issues of pay and rewards. What is really obscene is the stunning drop in revenues at the CIPD? The new CEO has managed to oversee an organisation in decline. Its commercial services income has dropped by several million and its operating profit halved (this means that the money covenanted to the charity has halved). At the same time salary costs have risen by 10%. (Interestingly the website breaks the law on presenting salary bands missing out the 100k-110k band (see p19)). Maybe Jackie hasn't read the CIPD report published this month called Transforming Public Pay and Pensions with its section on Ensuring reward practices are fit for purpose. On top of this she has been slated for making 41 redundancies in April 2009 and implementing a pay and bonus freeze, while trousering her massive bonus. In effect she was paid this bonus to produce a report on the future of HR – not that difficult. I have yet to hear of one member that has actually read the damn thing. She was also open to the charge of commercial favouritism by purchasing her pet agency Bridge Partnership (they go way back to when she worked with them at Pepsico). Way back it was predicted in Personnel Today that her lack of experience and business expertise would be handicap, “several senior HR figures have warned that her low profile and lack of wider business experience may prevent Orme from becoming the influential voice that the role demands”. The head of HR at EDF Energy stated at the time, "The fact that she’s an unknown player means you’ve got to question her credentials in terms of what she stands for”. So it has proved. So who is Jackie Orme? Well she spent her early career in the Welsh Steel industry, such a roaring success that there is, now, no steel industry in Wales. Then she was then HR Director for Walkers Crisps doing her bit for child nutrition, then Pepsico,well Pepsico UK and Ireland, that purveyor of copycat coke. She’s also a listed on the CIPD website as a Director of a real charity ‘Shelter’. Difference – that’s a real charity of a similar size, and the last accounts showed that the CEO earns less than a quarter of her salary. Weirdly, Shelter does not list her as a trustee, as she resigned from this post over a year ago on June 11 2009. Is she also claiming to be something she’s not? The problem here, is that the CIPD is a charity in name only. What charitable good does it really do? Run courses? Publish dull books? Produce second rate research? It’s also relatively small organisation. It has around 250 employees, many part time, so where’s the justification for these astronomical salaries. In the end Jackie Orme’s just another fake fatcat milking the system. I’m looking forward to the 2010 Annual Report – no doubt Jackie will have received some whopping reward while the organisation reports further decline. Game-based, social networking in learning? The big news in social networking is games-based, GPS tagging. Foursquare and Gowalla allow you to check-in, tag your location and record what you did/are doing at those locations, through badges, points, whatever. It’s like a spiced-up Twitter, with points for prizes. It’s part of a wider ‘awards for behaviour‘ movement with smaller sites such as choreswar.com, where you get points for doing household chores. It makes it fun for the kids by adding competition and prizes. Another is plusoneme.com, a ‘gold stars for adults’ site, where you’re awarded points by others for good acts. 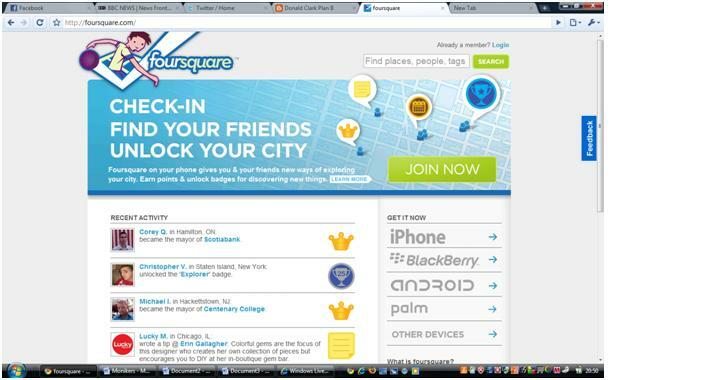 With Foursquare you download the app to your phone (most options covered; iphone, Android, Blackberry, Palm etc) then link to social networking, tell your mates where you are automatically on GPS position. If the place ain’t listed, add it. It’s all about recommendations. The game is to unlock badges and points. You can even become a Mayor for a location. Then there’s special offers for Foursquare users. Gowalla’s much the same think; check-in, GPS, then tag and share places and events you visit,with stamps, items and trips. Life’s a game was an old Nintendo strapline and that’s what these apps really try to achieve. What makes them fly is the clever introduction of a ‘game’ ethos to social networking. It’s like Twitter with Nectar points, game on for GPS tagging, with the clever addition of points, badges and titles. Now for a little though experiment. Suppose we see learning as a game? Rather than games in learning, see learning as a game, all of your learning as a game. Every time you do a course, acquire a skill, read a book, share some knowledge, attend a conference, discover something new; you report it by tagging the link and the more you do, the more rewards you get, say ‘Smart Points’. At the next level down you could apply the idea to all of your learning within an organisation, tagging courses, reading, research, skills and projects where you picked up new knowledge and skills. Even within a specific course, say induction, you could check-in, and collect badges for visiting specific areas in the organisation’s website, meeting the key people relevant to you and your job, doing the basic compliance stuff, learning how to use the IT, finding the toilets. And how about schools? Teachers and students could award or collect badges for pieces of coursework, homework, class attendance, understanding a topic. It could provide some badly needed motivation in key subjects. This last point is important. What makes this stuff work is it’s ease of use through mobiles. Malcolm Tucker of e-learning – me? I’ve been around in e-learning for a while, 27 years to be exact, and as I’ve expressed strong opinions as a CEO, blogger and speaker, I’m fair game. One aspect of the duck shoot I have enjoyed is being given monikers, once in a book by Julie Burchill, once during a Q&A session , once by a chair who introduced me at a conference, and this week on Twitter. Now I’m a fan of Julie Burchill, and as I live in Brighton, was delighted when she wrote a book called Made In Brighton. One chapter, on Brighton new media companies, was written by her hubby Daniel Raven, who worked for me for seven years. As I was reading it (he didn’t like new media or companies or e-learning) I wondered who the CEO called ‘Charlie’ was. Then it struck me - it was me! In a later blog exchange Daniel admitted that he had to change my name to ‘Charlie’ as the lawyers had stated it would be libellous. He clearly didn’t see the legal problem in admitting that ‘Charlie’ was Donald in the public domain of a blog. Then again, Daniel was never the brightest crayon in the box, and spent 7 years plodding away in the test department, saying little or nothing. And don’t think for one minute that silence means depth. I was tagged with this after giving a keynote to a large teachers’ conference. Now I had laid into traditional classroom delivery, the waste in having an IT budget in every school, the lack of sharing and general failure of the system to deliver improved performance after a doubling of the education budget. It came as the first question (more of a comment really) from a bod from BECTA. But JEREMY CLACKSON! I don’t even drive. Never been behind the wheel of a car in my life! Laziness really, I just never got round to it. Vaughan Waller, the chair at Learning Technologies last year introduced me as the Dame Judy Dench of e-learning. As a six foot four, balding Scotsman I was plain puzzled. I’m as far from a middle-class, English ‘luvie’ as you can get. To be fair, I suspect it was a reference to just staying the course. If it was age then comparison with a 75 year old is worrisome. 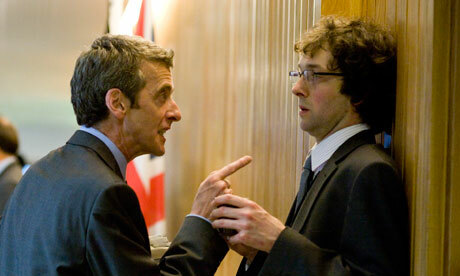 This week I’ve been called the Malcolm Tucker of e-learning on Twitter. This I like. For those of you who don’t know who Malcolm Tucker is, he’s a crazed, cursing Scotsman from the award winning political satire, ’In The Thick of It’ and the film, 'In The Loop'. It sort of captures the Scottish, swearing, ranting side of my character. My wife and teenage kids looked at each other and gave knowing smiles – it must be right. The student failed, but appealed on the grounds that the answer was scientifically correct. So the University appointed an arbiter. Since the answer given was felt to show no particular grasp of physics, the student was asked to come in and show, in six minutes, that he really did understand the basics of the physics behind the question. For five minutes the student sat in silence, then answered, ‘OK, drop it from the roof and measure the time it takes to hit the ground. The height of the building can then be worked out from the formula H = 0.5g x t squared. ‘Or, if the sun is out, measure the height of the barometer and the length of its shadow, then work out the height of the building from the length of the skyscraper's shadow. ‘You could also tie a string to the barometer and swing it like a pendulum, first at ground level and then on the roof. The height is worked out by the difference in the gravitational restoring force T =2 pi sqr root (l /g). The student was Niels Bohr, now known as the father of the quantum model of the atom, and a winner of the Nobel Prize for physics! But if you really want a new spin on crap assessment, this website shows funny, no hilarious, answers to questions set in exams. What I love about this site is the sheer wit, fun and creativity in the wrong answers. Sometimes it merely shows the futility of dull, abstract questions that one would never encounter in real life. First watch some selected answers from The Graham Norton Show. 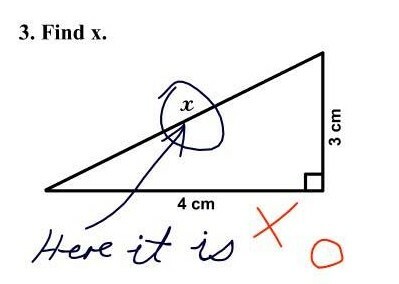 The ‘Find ‘x’? one has become a classic – answer a line to a circle around the ‘x’. Twenty-first century education must prepare young people for the tests of life, rather than a life of tests.